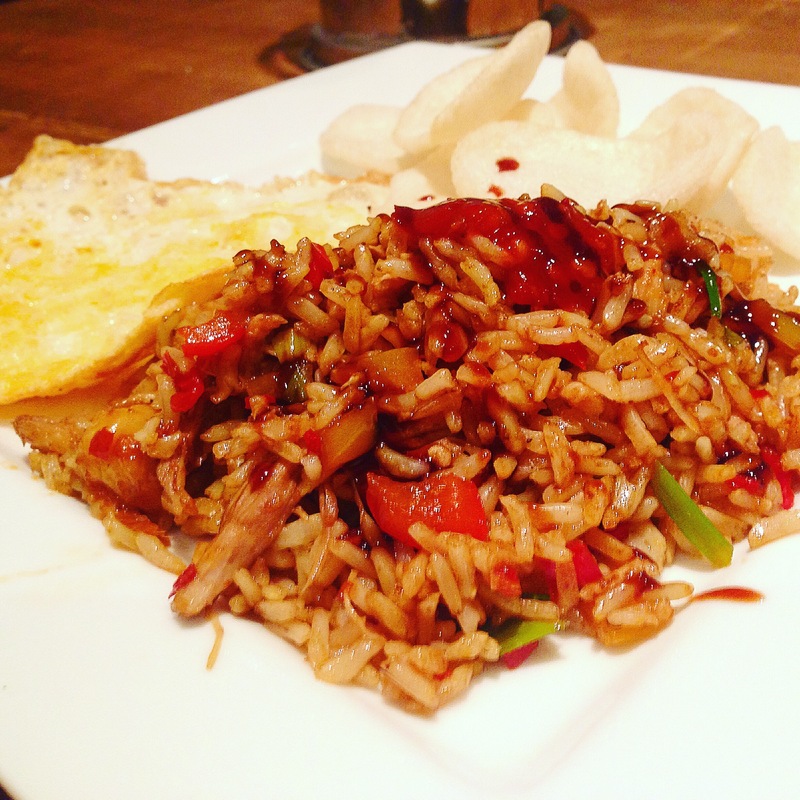 Nasi Goreng is a staple dish in Indonesia and Malaysia. It can be eaten for breakfast lunch or dinner. It’s a really tasty way to serve rice I ate it by the bucket load while over in Indonesia. I came up with this version after I came back and wanted something really satisfying for dinner after a long day at work. It’s such an easy and fast dinner to make. You can either have it as a single dish or use it to accompany other Indonesian or Malaysian Dishes if you’re throwing a dinner party. Traditionally it’s served with a fried egg and prawn crackers and drizzled with Kecap﻿ Manis or Sambal. Left over shredded roast chicken or use some fresh prawns instead. 1. Chop the vegetables up finely. If boiling rice from scratch out your rice on to boil and start 2. Once boiled. 2. Heat a wok or frying pan and add a little sesame, peanut or vegetable oil. 4. Add the Ginger, white pepper, Kecap Manis and Sambal. 5. Add the prawns or chicken. (Leave these out for a Vegetarian Version). 6. Get a small frying pan and heat some oil, add the beaten egg and fry the egg. Also if using microwave rice heat the rice. 7. Add the rice to the vegetables and meat in the wok and stir through thoroughly. 8. Take the fried egg off heat and put it to the side. 9. Put the Rice onto a plate place the egg on top and add some prawn crackers. 10. Drizzle with Kecap Manis and Sambal and serve. Coz i am indonesian, this foods can i meet at the infront of my house..